Popular among the young and active, our platform beds are well-priced and stylish. Their simple lines are perfect for creating an uncluttered, almost Zen-like environment. We have combined some of the best features of our Balboa platform bedroom furniture set and Starboard platform beds to achieve this fusion of convenience and elegance. This platform bedroom furniture set boasts three large deep drawers on each side of the bed (for a total of six drawers), smoothly sliding on full extension hardware. Nightstands allow for easy drawer opening right through. These beds are constructed of beautiful solid wood. Use an mattress below, which is proportionately designed to allow this headboard to be properly shown and provides a great night's sleep. Solid Wood Notice: This frame is solid wood. Prolonged exposure to direct sunlight will cause fading and spliting wood. Our PostureSense 10" Deluxe Memory foam mattress perfectly complements this frame. It comes with a luxurious Terry Velour Case, sewn with a zipper on three sides for easy removal and cleaning. Soft, supple touch of this poly cotton fabric enhances feeling of your new mattress. Made in Portugal. 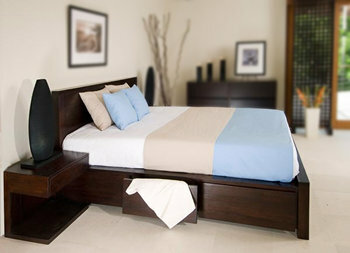 Our Staccato platform beds come only in Queen size. If you would like a frame like this in other sizes, try our Atlantic frame. Staccato features clean sharp lines. The Wengé finish (pronounced "when-gay") is made from genuine American Beech wood and then stained its deep wengé color. This real wood veneer is then laminated to MDF. The Cherry finish is made from genuine American Cherry wood. This veneer is then laminated to MDF. This collection lives up to its photo in every way! Use our recommended mattress to maximize the aesthetics of these platform beds and achieve proper orthopedic support. 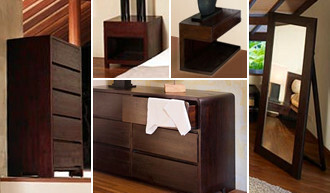 Order nightstands for your frame. While the nightstands pictured above do not have a drawer, there is a free standing one with drawers ... see matching bedroom furniture images lower on the page. The curves in the Show Mirror accents this set nicely. our Marin store, located in San Rafael. Our San Francisco store has them in stock. in our San Rafael store. These platform beds combine contemporary elements found in low European and Japanese beds with local made craftsmanship of the ******* USA. 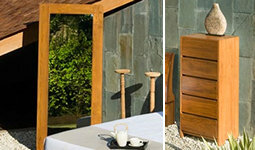 Inspiration for these platform beds came from the Classic Teak bed, also found on this page. You have _ colors of solid wood w/ sustainable veneer____. 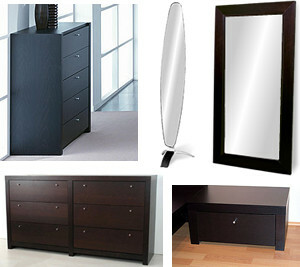 We recommend the matching "Curved Dresser" and "Wall Mirror" to soften the strong angles of this collection. The Wengé finish used is non-toxic and provides Natural finish and is a water based stain, same used on children's wooden toys. Rails around the platform bed's edge are 6" (15 cm) wide. From floor to top of the rail is 9" (23 cm) with 3" (8 cm) of open space below the rail. Use our foam mattress to properly accommodate a proportionate display of headboard and comfort. Solid teak construction. This earthy platform bed is gorgeous. The Natural finish is a water based stain, the same used in children's wooden toys. Slats rest 2 inches (5 cm) below top edge of the platform bed. This will snugly hold your mattress in place. 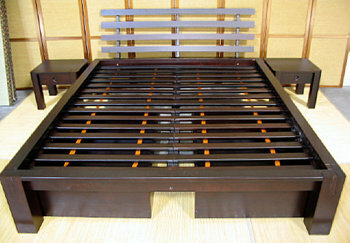 Height from the floor to the top of the bed platform is 16 inches (41 cm). Width of the rails adds 6 inches (15 cm) all the way around. Use our recommended mattress to maximize proportionate aesthetics of these platform beds and achieve proper orthopedic support. Note: this bed can be counted towards other items shipped over $1200 for free, but the Classic Teak platform beds are not an item we ship for free, as it requires excessive packaging. These platform beds have a transitional style with Asian influence, and will add tranquility to any bedroom furniture set. 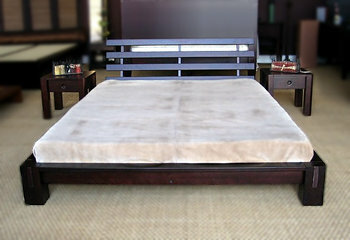 It is a classic solid teak platform bed and comes in either Antique Mahogany or Natural Teak finish. Be sure to choose if you want an platform bed with a headboard or not. The mattress displayed combines the right amount of height and comfort. 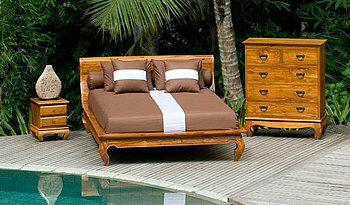 These beds are hand carved and feature old world craftsmanship, charm, and possesses a sort of rustic construction. Please see detailed picture by browsing photos album to the right. Sunrise platform bed is one of our purist designs featuring solid wood and easy assembly — very Zen. 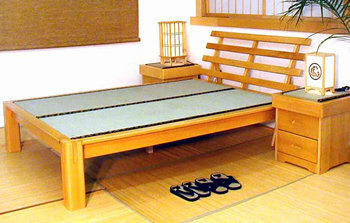 Optional tatami mats are sold separately. Tatami Mats can only ship on a pallet via a trucking company like Roadway — not by UPS or US Mail. 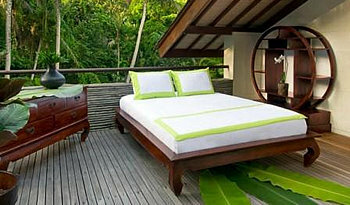 Sunrise platform beds are made of a hardwood from Indonesia. With unique cross-grain corner joints, this bed is sturdy and easy to assemble (assembly is required on all pieces). Each piece simply slide together at the corners. There are only three bolts used in this bed. Slats are two inches lower than the surface of the bed. These frames ship via FedEx ground; no pallet is necessary unless you purchase nightstands or dressers, too. Headboard is optional. Use our recommended mattress for comfortable orthopedic support. It is properly fitted for the headboard, but also suits the bed nicely without an headboard. We offer the Sunrise in two heights: "standard" and "low." 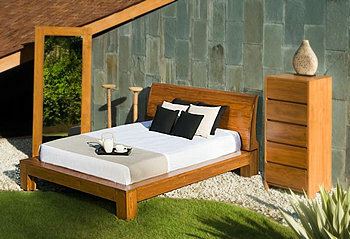 Our Standard Sunrise Beds are an ideal 16" (41 cm) high boasting 11" (28 cm) of open space underneath. This space can accommodate one or two optional sets of drawers that slide beneath the platform bed frame (a set is two drawers). The standard Sunrise platform bed is shown at right. An Low Sunrise Platform Bed is a traditional 9" (23 cm) high. Displayed to the right. San Francisco and San Rafael showrooms. Due to customer interest, a queen size has two holes in the head rail to allow an option of an attached headboard.